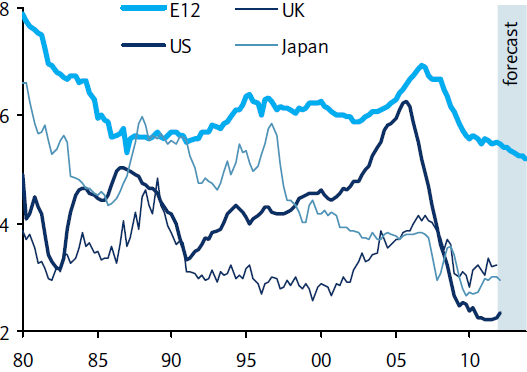 Japan and Germany have basically been stagnant (although there are stories that German property markets have picked up). China's housing is right in line with the US because China's high inflation rate has held real home prices subdued in spite of large nominal price appreciations. 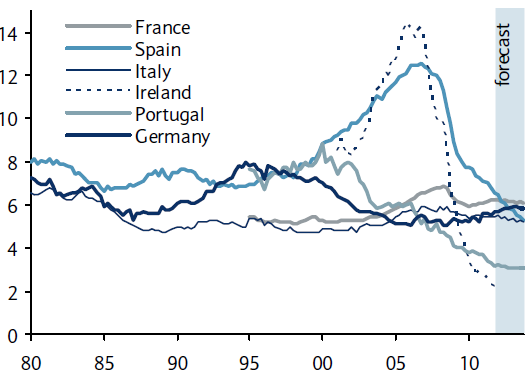 Ireland and Spain are coming off their bubble (though still high on a relative basis), while the UK and France look quite elevated. 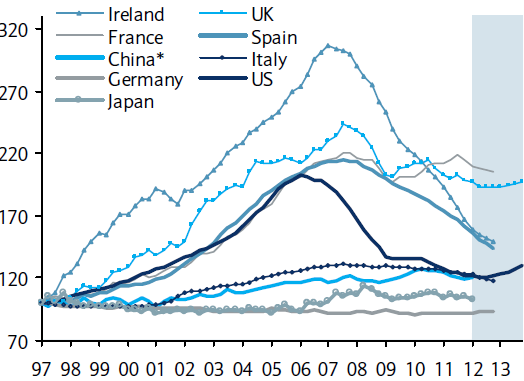 Residential investment as percentage of GDP (chart below) tells us who is still building and possibly overbuilding. Clearly in the US residential construction is a shadow of what it was even before the bubble. The Eurozone on the other hand seems to keep pouring quite a bit of money into residential development. That's surprising given the economic state of the euro area. So who in the Eurozone is in the "building mood"? The next chart breaks it down by country. Spain's resi investment is off the highs, but still about 6% of the GDP - the excess has clearly not been fully unwound. Spain should be where Ireland is now and therefore has ways to go. The banks financing this must still be in their denial mode - and the rest of the Eurozone will be paying for it later. Ireland and Portugal on the other hand got the message loud and clear, getting rid of the excess. The rest of these nations just keep building as if nothing had happened, keeping the overall Eurozone investment levels high relative to other developed nations. And the banks are obviously financing all this investment. More denial.